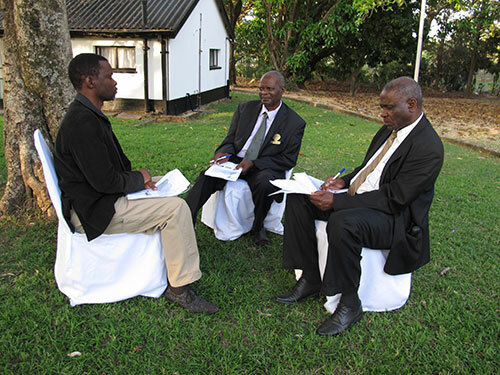 Traditional leaders in Zimbabwe preparing a mediation role play exercise. Image: Valerie Sticher/Center for Security Studies (CSS), ETH Zürich. This article was originally published in the Bulletin on Swiss Security Policy, a publication of the Center for Security Studies (CSS) at ETH Zurich, on 27 October, 2015. After years of estrangement, Zimbabwe and the West have slowly started to re-engage with each other. The popular approval of a new constitution in 2013 – which introduced significant civil rights – and the subsequent peaceful elections provided the impetus for the thawing of relations. This included the easing of European Union (EU) restrictive measures imposed in 2002 following Zimbabwe’s controversial land reforms. But that’s not to say that the country’s myriad challenges have been resolved once and for all. The unresolved succession of 91-year-old President Robert Mugabe, who has ruled Zimbabwe since independence in 1980, continues to paralyze the country’s politics and economy. High levels of unemployment and empty state coffers make economic survival most Zimbabweans’ main concern. Finally, there’s a growing need to undertake a series of far-reaching institutional reforms, particularly when it comes to Zimbabwe’s security sector. But how do you tackle such an undertaking in a country where there is a lack of political will and capacity for such sensitive reforms? The Zimbabwe Peace and Security Program (ZPSP) is determined to tackle this problem head-on. Established in 2010 by former independence fighters, the ZPSP recognized from the outset that the country lacked the capacity to enact security sector reform (SSR) and that state actors were largely reluctant to engage on this issue. Many Zimbabweans, in particular the government and members of the security sector, view SSR as a process imposed by outsiders, which in their view includes a regime change agenda pushed by the United States and United Kingdom. What this overlooks, however, is that SSR is not about replacing individuals in the security forces, but about adjusting the security sector to meet the needs of ordinary citizens. To complicate matters even further, a large part of the Zimbabwean population associate the term “security” with the military and the police, and thus refuse to engage with the task of contributing to solutions or demanding concrete changes. Consequently, there was a need to demystify the term SSR and to prepare the country for sectoral reform. The first challenge for the ZPSP was finding the right international partners. As was to be expected, the US and UK were out of the question due to their association with the regime change agenda. Things were a little different with the EU, Norway and Sweden who were willing to fund the framework program. In the shape of Switzerland, the ZPSP eventually found an impartial actor with a predominantly positive reputation in Zimbabwe to support the implementation of a project aimed at building consensus around security sector transformation. Coming to this arrangement was due in no small part to the long-standing collaboration between Swiss experts and the director of ZPSP. It also paved the way for experts from the Swiss Federal Department of Foreign Affairs (FDFA) and ETH Zurich’s Center for Security Studies (CSS) to support the undertaking not only financially, but also with knowledge and experience gleaned from previous activities. Since mid-2014, representatives from different societal sectors have been developing sectorial action plans in a series of workshops under the lead of the ZPSP. In this respect, drawing a context-specific selection of societal groups has been an imperative. Besides civil society, parliamentarians, military and police representatives, the organizers also work with traditional leaders. These play an important role in the delivery of human security, particularly in rural areas. At the end of the process, all important stakeholders should be represented in a steering committee and will negotiate a common, national action plan. The aim is for the government to own this national plan and to put into place the necessary structures to allow for its implementation. To allow actors to reach consensus on the way forward, it has been important to create an atmosphere that is conducive for dialog. With that object in mind, the Swiss FDFA and CSS experts have provided inputs on negotiation and consensus building methods. Through simulations, role plays and other exercises, workshop participants have strengthened their negotiation and consensus-building competences and are then able to apply those skills within their own sector or in communication with other actors (e.g. the government). Furthermore, the workshops offer participants the opportunity to exchange views with actors with whom they usually have no contact – such as high-ranking military officers. Such encounters, aimed at advancing SSR together rather than confronting each other, had hardly been possible before. A key principle of the project is local ownership: the idea was conceived and implemented by a local partner, while Switzerland supported the project financially and through mediation expertise. Inclusivity – the representation of all relevant issues and actors – also plays a crucial role. This is not only the case in terms of participant selection, but also regarding the composition of the ZPSP. Its trustees cover the entire political spectrum and, as former combatants in the liberation war, enjoy a special status which gives them legitimacy and some degree of political independence. This is highly important for the acceptance and credibility of the program. The organizers managed, due to their active and transparent communication, to improve their relationship with the government and military representatives, who were at the beginning, skeptical about the project. However, some serious challenges remain: the undertaking is a long term project where visible changes within a short project cycle cannot be expected. This renders the project unattractive for many donors. Also, due to the sensitive nature of the project, both the ZPSP and its Swiss partners have to approach the topic carefully and react flexibly to changes in context. Participation in the project benefits Switzerland insofar as it allows it to expand its mediation expertise to a new area, and, through this innovative approach, to position itself internationally in the field of SSR. In this respect, the lessons learned (so far) from this project are highly interesting for the advancement of SSR concepts worldwide. Without the relevant preparatory work, SSR is doomed to failure – not only in Zimbabwe. This is not just a problem on the side of the recipient states: often Western donors demand reforms which are based on a Western understanding of state structures, which leads to problems when the reforms are implemented. Meanwhile, countries that lack liberal democratic credentials are often the ones that need SSR the most. Building up political will and the capacity to assess the security sector and to reform it in a context sensitive way are preconditions for success. In a time where the UN and other driving forces of SSR have recognized the importance of local and national ownership, but still largely fail to achieve it, the Consensus Building in Security Sector Transformation Project implemented by the ZPSP with the support of Switzerland could gain importance far beyond Zimbabwe. Valerie Sticher works as a program officer with the Mediation Support Project (MSP) at the CSS. She focuses on mediation training and process support, with a current particular emphasis on Zimbabwe.